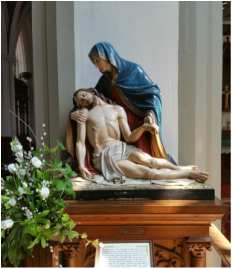 Saint Faustina's diary is a written record of a love affair between two great lovers - Saint Faustina - a humble servant, and Jesus Christ - her Master. The very tender love God has for mankind walks across every page of her work, revealing with great clarity a loving, merciful God, a God made vulnerable by His great love for us, and His respect for our free will. Jesus said to Sister Faustina: "Apostle of My mercy, proclaim to the whole world My unfathomable mercy. Do not be discouraged by the difficulties you encounter in proclaiming My mercy. These difficulties that affect you so painfully are needed for your sanctification and as evidence that this work is Mine. My daughter, be diligent in writing down every sentence I tell you concerning My mercy, because this is meant for a great number of souls who will profit from it." I believe in Jesus Christ, his only Son, our Lord. He was conceived by the power of the Holy Spirit and born of the Virgin Mary. He suffered under Pontius Pilate, was crucified, died, and was buried. He descended to the dead. On the third day he rose again. He ascended into heaven, and is seated at the right hand of the Father. He will come again to judge the living and the dead. I believe in the Holy Spirit, the holy Catholic Church, the communion of saints, the forgiveness of sins, the resurrection of the body, and the life everlasting. Amen. Divine Mercy, fount gushing forth from the mystery of the Most Blessed Trinity, I trust in You. 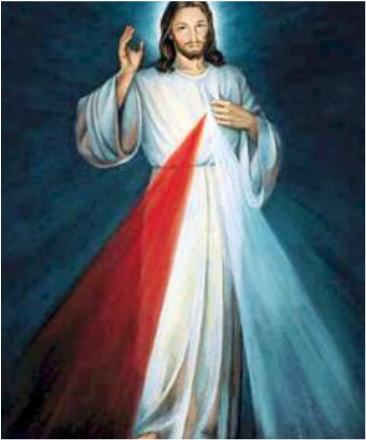 Divine Mercy, unfathomeble by any intellect, human or angelic, I trust in You. Divine Mercy, crown of all of God's handiwork, I trust in You.